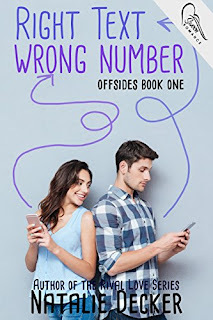 Today is my stop on the Right Text Wrong Number blog tour. This book published by Swoon Romance is YA Romance (my favourite kind of romance) and is by Natalie Decker. 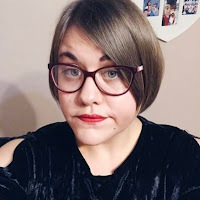 I shall be sharing a guest post by the author herself talking about the new addition to her family, as well as a giveaway. Enjoy! While I’m currently finishing up writing Book 2 in the Offsides series, I’m also venturing on being a new mommy again. No, I’m not pregnant, but for my anniversary I did get a delightful little addition to our family. If you have seen my Instagram or Facebook post you’ve seen little Miss Roxi. She’s a little ball of Sunshine. She’s also a licker. No, she licks everyone. Loves giving her kisses. Even though she wasn’t the breed I wanted, that was a compromise with my husband I do love her to pieces! So recently we took our lovely chocolate Lab to the vet and this I guess you would call her a nurse, asked me all these questions. From where Roxi sleeps to how her diet has been. But when I stressed my concerns about her scratching a lot but not having flees (Because I do give baths) she made it out to be like I was crazy. Turns out I wasn’t my poor little pupper has a slight ear infection. Tomorrow I’m happy to report is her last day of her ear medicines. I thought meeting deadlines for my books were a challenge. Entertaining a new puppy while trying to put ear drops in their ears beats meeting deadlines any day. Phew … but I do love this adventure and who knows maybe it will give me a little idea for my next book. Have you had any challenges lately, if so what were they? (If they are too personal, you do not have to share) Have you any new things adventures lately? Thank you for stopping by. I do hope you enjoy RIGHT TEXT WRONG NUMBER. For Layla and Tyler getting a Text meant for someone else inspires an adventure of epic proportion for these two. started at age twelve when she had to write a poem for English class. However, seventh grade wasn't her favorite time and books were her source of comfort. She took all college prep classes in High school, and attended the University of Akron. Although she studied Mathematics she never lost her passion for writing or her comfort in books. She's a mean cook in the kitchen, loves her family and friends and her awesome dog infinity times infinity. If she's not writing, reading, traveling, hanging out with her family and friends, then she's off having an adventure. Because Natalie believes in a saying: Your life is your own journey, so make it amazing!